As I told you earlier, my CBX Alternator chain was rattling. In addition, there was an alarming oil consumption and the engine compression was low. So I decided to restore the engine to its former glory. 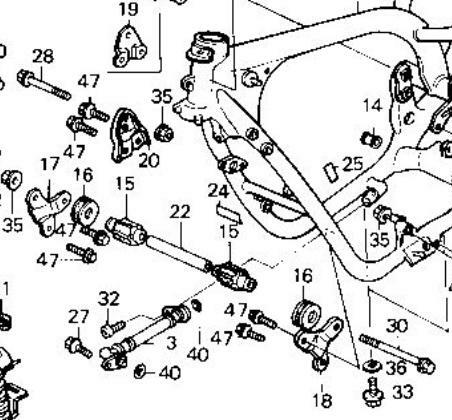 Getting the parts puzzle was not too difficult: there is enough stock for the CBX. In Europe there is everything, of course. If you need something and do not have it in the UK, they say what country stocks it in Europe and who can sell it to you. Again, Europe, because of the African countries, south of the Pyrenees, is that nobody in Europe knows the phone or mail to contact Honda Spain. Do not talk of integrated stocks in the European network, of course. 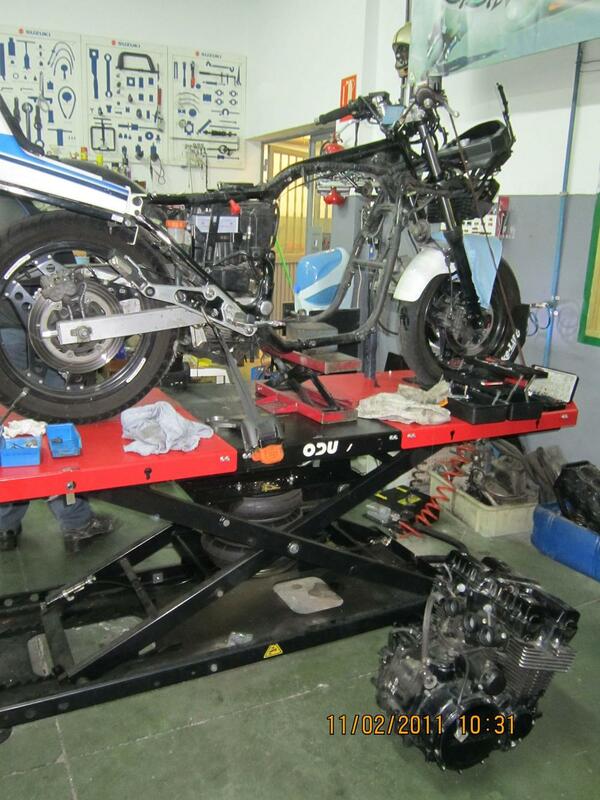 To order a replacement from Honda Spain seems to be that you do it by letter, smoke signals or carrier pigeons. Shameful ! Disassembling the engine is not too complicated: everything is at hand and only a special extractor is needing to remove the alternator, although it is quite easy to manufacture one with a screw with the appropriate thread. Being organized, sorting parts in stages to remove in different boxes (chassis and brackets, cylinder head, clutch, ignition, alternator ...) and taking lots of photos, the reassembly does not present too many problems, also helped by a workshop manual, very clear and well illustrated with photos, not like the drawings shown on Yamaha manuals, sometimes not very accurate. Removing the cylinder head valves is a difficult issue without the proper tools, and it is advisable to take it to a specialist to grind the valves and seats, and to clean the head. The engine comes out by the right side of the frame. No screws were rusted or rounded. 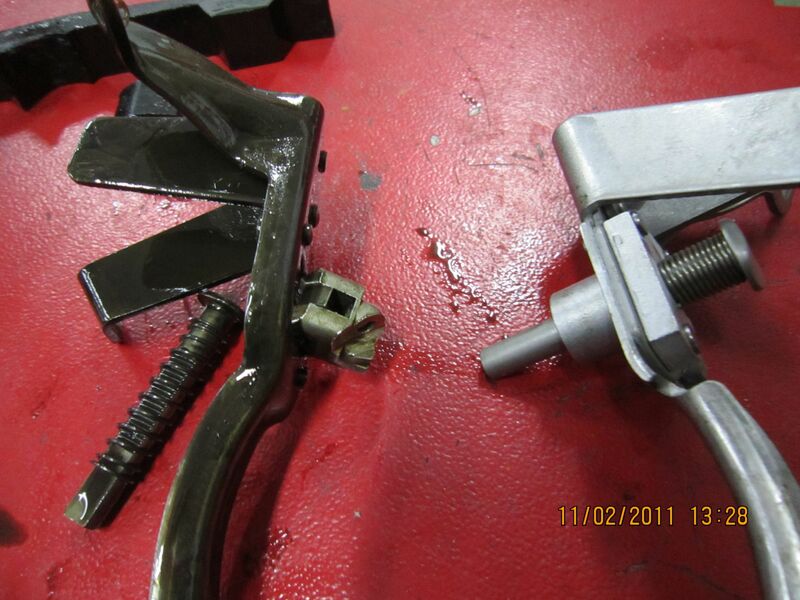 When I removed the headstock the first surprise arose, the cam chain front guide was cracked and about to break. At the top of the picture you can see the broken guide, because it almost broke when I touched it. When I finally reached the alternator chain tensioner and I extracted it, I saw with horror that was broken. Fortunately, the different pieces were left in a corner of the crankcase. I hate to think what would have happened if it entered any part in the change gears shafts. Clearly, this tensor is a problem with this type of engine: both on the Brazilian Forum and on the team as RC17,it is a recurring theme the engine reconstructions due to tensioner failures. Tony Galea, from Galea Cam chains in Essex, UK, says to the team RC17 that the tensioner is a certain failure unless you ride one of the last generation tensioners, one like mine or the Brazilian CBX latest model, revised by Honda two times over time, and CB 750 1992 fitment. The original Honda alternator chain is almost impossible to find. Honda Europe informed me that there were only 4 in Europe: 1 in Holland, 1 in Switzerland and 2 in Italy. The Dutch responded that it had been already sold, so now there are only 2 in Italy ... and that's if they still do. But there are solutions: Tony Galea makes you a very cheap one tonygalea60@yahoo.com .. And the Brazilian part is exactly the same, although the number of Honda part is different due to the chain is made for another builder. Watch Brazilian parts in the photo. As can be seen in the photo on the left, the new cam chain (centre) is exactly the same type as alternator chain (below), and stronger than the original cam chain (superimposed above). Whereupon, as 3 rd solution on the chain replacement problem issue, you could buy a Tsubaki chain of the same type and 2 soft links and manufacture both chains, counting the number of links. Checked the cylinders (as-new), pistons, valve guides, valves and crankshaft and connecting rods support and everything is on safe measurements, without showing significant wear. So in the end only a change of segments and a thorough cleaning of the cylinder head, because it has carbon deposits of both valves as the internal. A mention is due: the oil seals that fit around the gear drive sprocket shaft, at the left of the crankcase, are not included in the complete gasket set nor in the OE Honda crankcase gasket set. Those are PN 206-MJ0 PN-005 and PN 207-003-MJ0. The shaft rod pusher Clutch seal, PN 91204-MB0-003 is not included. It must be purchased separately. By the way, I have the clutch out I have installed an EBC clutch plates kit, reference number 1166, which are very good. With the crankcase opened, it must be asked whether to change the starter motor clutch (# 3 in photo). It's expensive, but if it breaks you would have to split the cases again. But a great torque reducer is very effective and well-made, (no. 6 and 7 in the photo) built to help the starter clutch kick-back, to avoid excessive strain on the mechanism. Bravo!. What it is made of iron weights?, and what is the problem?. Go to WC before, to ride the bike to compensate. Clearly it is a safety mechanism that prevents expensive breaks as on CBR series. What happens is that it must be cheaper not to put it in , of course. On reassembly, it does not present problems if you do it step by step. It's even easier than to remove, and above all, cleaner. To tighten the clutch security nut you have to reassembly the cylinders and headstock: the manual procedure doesn't work: you can't hold the right crank nut strong enough to tighten the clutch nut to 8 kgm. To assemble the rings we started using a compression ring tool, but in the end we chose to go down the cylinder block slowly and introducing manually, the rings one at a time, by being very careful and rechecking a lot of times. Slower and more laborious than using the tool, and 2 hours & 2 men work, but very precise . It also eliminates further, the use of special tools. Beware of the dowel pins that guides the screws that hold the supports of the rocker arms (no. 15 in the photo). They are 8 and is very easy to forget about them, especially if you've placed in another box apart, like us. We had to repeat the assembly of camshafts again . Get the top dead centre. Then, watch the cams: the exhaust one must have the EX sprocket mark facing at the front and the inlet IN one must be facing to the rear of the bike. If not, turn the engine 360º until facing the top dead centre again. Then, dismount. The refitting is immediate: put the crank at the top dead centre and fix the cams exactly as you removed, with the marks at the same positions. The purging of the hydraulic tappet plugs is not necessarily done as Honda manual states. It is easy, even bleeding by hand with a cooper wire (never use hard metal wire. It could damage the tappet plugs) just hand tight, in an oil bath. When I dismantled the bike I introduce all the plugs in an oil bath and left them there until reassembly. It is a lot of work to install the carbs back due to the tight space and the manifolds strengthen / hardened, due to age and engine heat. To recover part of the missing elasticity, keep the manifolds in boiling water for 10 min. when very hot, immerse those in a liquid Vaseline bath. 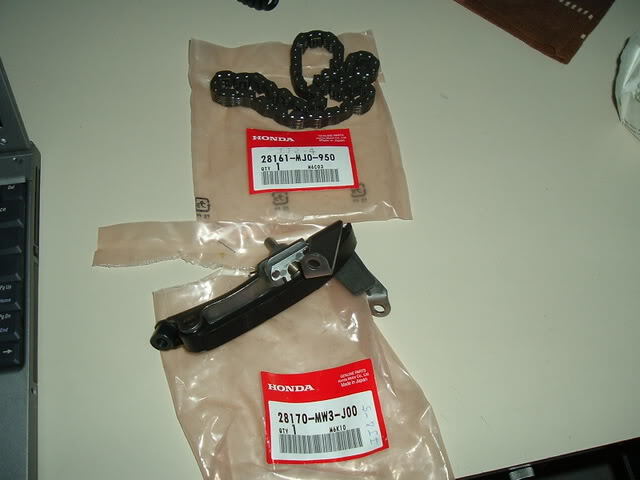 This parts are obsolete from Honda, but it is possible to get them new in another countries. Contact with me if you fancy a pair. You could eliminate the grill inside the ducts: these are to prevent a misfire burning the air filter, but if your bike misfires, the filter is the less important problem. When the engine is back on the chassis and everything is in place, starting the bike was exciting. Start switch ... and although the primary chain rattle is gone, a tinny clank clank clank sound emerged from the rear left of the engine. Osculated carefully with a modified phonendoscope the sound came from the wall of one of the collectors. The CBX main headers are double wall type as the FJ 1100 ones and it seems that an interior wall has cracked. 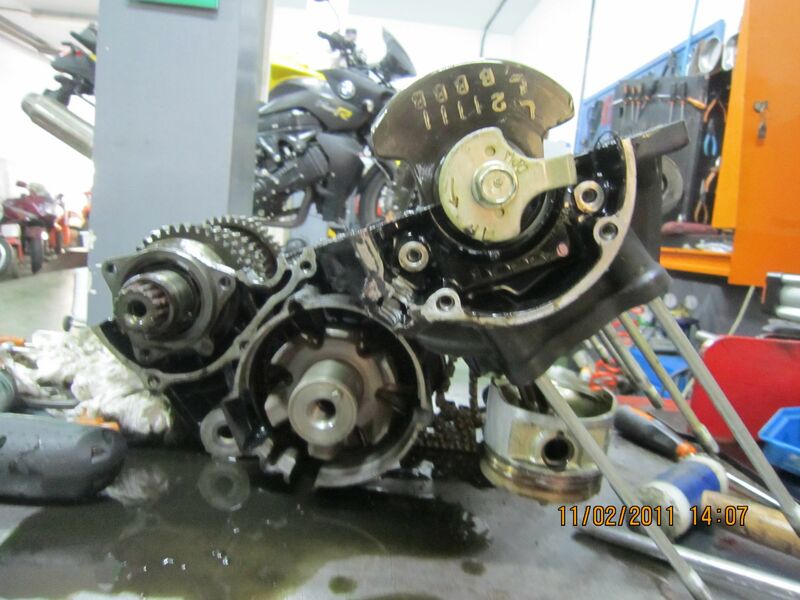 In addition, there is an oil leak from sprocket cover. 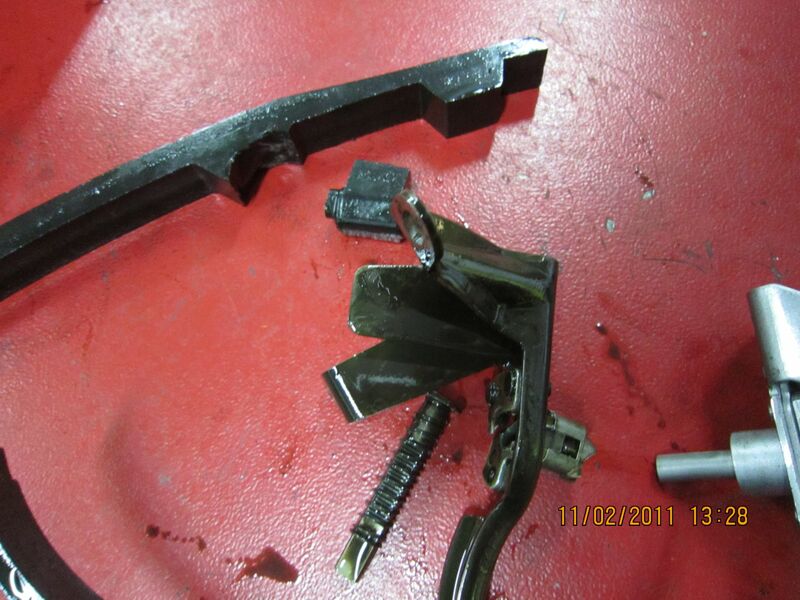 It comes from the selector cover gasket, see pix, so it is not a important problem. Easy solution. 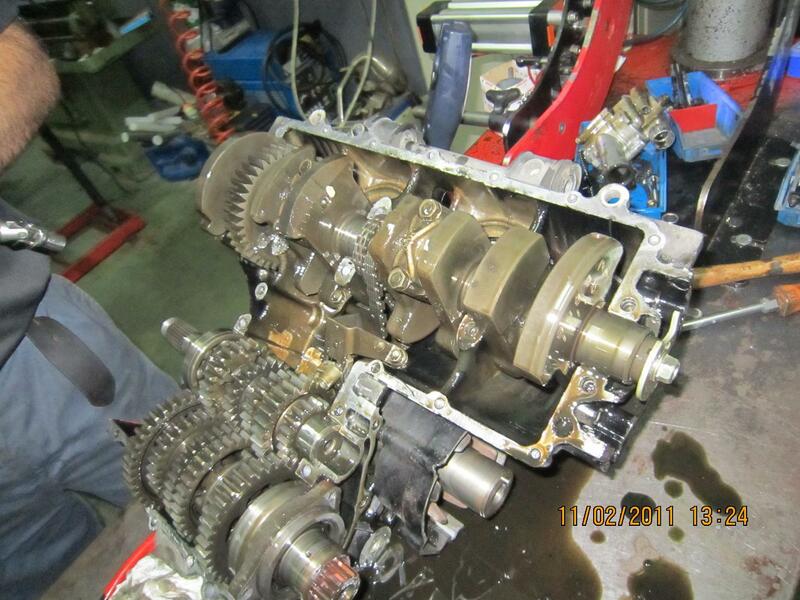 There is no oil leaks from the block, crankcase and cylinder head, a sign of a job well done. Without the CLANK CLANK noise the engine sounds sweet . In fact, it must be better than new when I finished the work: with parts repainted, screws changed, and new seals and rubber and with a carefully run out of 1,000 kms. done when I solve the above problems. Oil and filter change and ready to repair the little oil leak. A work that is around 15 min. with the engine out of the chassis it has been a 4 hours nightmare fighting with the bike. Inside the cover we find the gearshift lever axle (20). To extract the case you must dismount the case and the axle, all together, because the space between the chassis lower rail and the engine is too tight. When refitting, the first approach is to install the gearshift lever axle, that engage with the drum nº 10. When fitted we are going to refit the case and ... it is impossible because there is not enough space. I dismounted half the bike around to try to make space, to fit the case, impossible. You have to insert everything at the same time: the case with the axle inserted and the shim 28, that it is all time falling down when you're manoeuvring to introduce the case with the axle fitted into the tight space between the engine and the frame rail. After all this work and working the gear selector perfectly, I started the bike, get temperature and it doesn't leak anymore. Work done! The bike started to not work correctly all the way up, from 8,000 to 11,000 rpm. The first impression was gasoline starvation. I went crazy doing carburetion tests and nothing. The bike had phenomenal low-and middle power but not above 8.000 rpm. Until one day I stopped to refuel and when started the bike rattled so badly that it almost did not come home. I removed the spark plugs and I noticed that the cylinder 2 and 3 plugs were black, the first sign of failure of the right-coil, which supply the spark to the inner cylinders. I changed the plugs and checked coils and connections with the tester, and apparently was all right, I started the engine again, and the bike was going well .... until it got heat in my garage and failed again. The culprit was clearly the coil. When the coil was cold it is right, and meets all measurements but when the engine is hot, the coil fails. The problem was unnoticed for a long time because I never get into jams and when on open road the coil is refrigerated. It appeared when I stopped with a hot engine and the coil got warm. I located a couple of coils from a breaker, replaced the right coil and problem solved. Any coil with a primary resistance of 3 ohms could be used, but I want the bike as original as possible. The engine from the later CB750 (RC42) fits perfectly into the RC17 frame. Even the oil cooling (through the frame) can be connected without any issues. However, the RC42 engine is different in some key areas...the small and easy to overcome differences are as follows. Neither of the first two are a big deal as you can get a clutch lever and perch (and a cable) to suit the RC42 engine. And the difference in power (73hp versus 92hp) is up to you. The nasty and harder to overcome differences are as follows. 5. The RC42 engine has a different firing order (1-2-4-3). RC17 is 1-3-4-2. 5. The RC42 engine has different cams. Now, you're probably thinking WTF! How am I going to do this transplant? Answer: What you HAVE to do is make sure you have a complete wiring loom from an RC42 (including the CDI unit). If you don't, you're stuffed! How do I know? Guess! It's good to get hold of a good RC42 engine though, as many of the internal parts are exactly the same and you can pick up low mileage units from time to time. As most of you know, the RC17 engine isn't exactly common and parts are hard to come by. My bike had been started to vibrate a lot, mainly at medium rpm., the most uncomfortable range. I re-torqued all the engine support to the specified setting and changed the front engine support rubber. Its incredible the big difference that you get when only change those grommets. The parts to change are numbered 15 & 16 at the pic. Dead easy to to.